The Curious Cave….where I head on in with a cuppa, find a cosy corner and switch off from everyday life. I’m inspired daily by these creative geniuses already out in the world – I hope they inspire you too. This will be an ever-evolving list (newest updates listed first) and as I get through this collection of books (that I got for Christmas), and discover more and more people through social media and podcasts, I’ll be posting reviews too, so keep popping in now and again. And if you’ve found other great reads or listens out there, please do share either on @curiouscreativeclub Instagram page or email me via the contact form below – sharing is caring after all and the beauty of this page is for us all to learn together and discover the magic makers out there that can help or inspire us further. This is a brilliant much-needed book in the crazy creative world of Instagram. It draws on Sarah’s experience of creating a huge account that has to date 213k followers and breaks it all down into the four simple sections of: Storytelling, Making Pictures, Archiving Your Life and Sharing Your World. A must for anyone who is captivated by creating those little squares. This book is an absolute must for all creatives! I absolutely love it so far. You’ll find yourself nodding a lot as Elizabeth almost takes us on a spiritual journey to discover the myths, process and absolutely necessity of creativity in human’s lives – if we want to live a great one that is. This is looking at journaling not just as a cathartic way to download a bad week or experience but to actually help shift your mindset too to one of seeking out the positive moments, no matter how big or small, that do happen in every day life, even on a really crap day. For those at the start of their painting with watercolour journey, this is such a simple, modern, step by step book that’s really easy to follow. This is what I used to create my cactus picture! I’ve come across Emma in various magazines admiring her beautiful sketches capturing the seasons for Country Living and Breathe Magazine, among others. 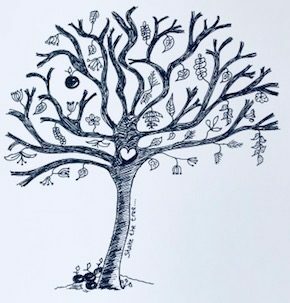 Here she delves deep into the seasons, explaining how nature can heal us and help our mental wellbeing – a woman after my own heart as that’s what I champion via my insta account @soothedbynature. Plus, as you’d expect, it is beautifully illustrated. This is more of a self-care book but important none the less for the likes of us creatives who work from home and often get so engrossed we forget that occasionally we need to look after ourselves! It’s a brilliantly written book, split into really good sections, using the vitality wheel as a focus so you can work out where your attention needs to be. It’s easy to get through and just makes total sense! Country Living – often showcases crafters, artists and people who work from home on country makes. Podcasts – This is a really great time-saving way to learn whilst doing other things such as cleaning or walking the dog! Best of all, they are free! Just use your podcast provide on your phone, such as Apple podcast or download a free Ap such as Stitcher, Spotify etc. Author Accounts: There are my top 3 fiction writers that I love so depends if you like that kind of thing!